This Insight Chart is adapted from ‘Dependent Origination’ or ‘Wheel of Life’ chart ? On the day Buddha attained Nirvana, during his meditation, he saw the true nature of all things and why people are unhappy. He understood the dependent origination. One thing leads to other and it forms a cycle which is difficult to break without proper understanding. Buddha understood why some people are happy and some are unhappy and are suffering. What he found out after years of effort, he made it available to everyone to benefit. 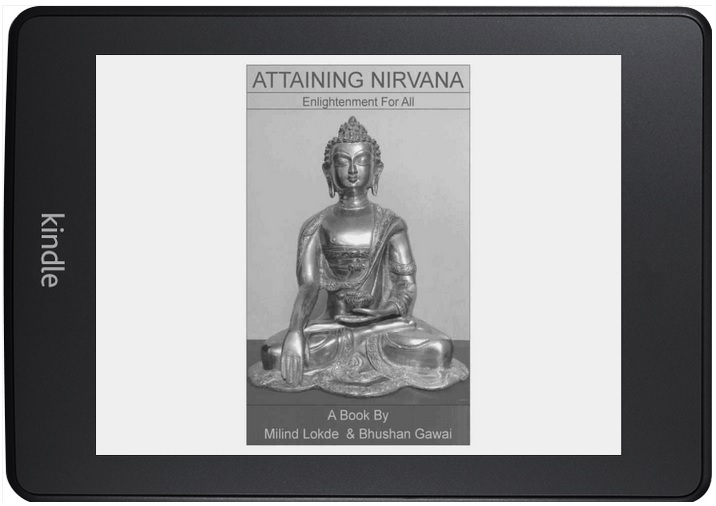 He found the nature of all things, the dependent origination and the path to Nirvana. Now it is on each of us to put in effort and be free from suffering. 5. Six Senses – Name and Form is accompanied by the Six Senses of Sight, Hearing, Taste, Touch, Smell and the Mind emulates all other five senses. There are two charts here. One is the original and lively pictorial chart in chapter on Dependent Origination, and the other, Insight Chart in this chapter, is the same chart mapped on the palm for better memorization and practice in daily life. Readers here have a choice to prefer the first chart or the second chart or both for different place and time. For being constantly aware of the dependent origination, we have had it adapted to be plotted on our Right Palm where we do not have to make any changes. This chart shows how some people make their life miserable with their wrong thoughts, speech and action and how some people enjoy good life after freeing themselves of the root causes of suffering (Ignorance, greed and anger). It also shows the cause and effect relationship that makes our future good or bad and also how we can break the chain of cause and effect to become free of suffering and attain Nirvana. 1. The three root causes of suffering ignorance, greed and anger depicted by the edges of inner triangle of the palm. 2. Beings sliding down into life of suffering (marked by the dark arrow pointing down adjacent to line of greed in the picture) and Beings climbing up (Marked by a white arrow adjacent to edge of ignorance). 3. The Six worlds (marked on the mounts of the palm) of that of Human, Titans or asuras, Gods, Animals, Hungry Ghosts and Hell beings. 4. The Four fingers with their three phalanges each shows the twelve links of cause and effect relationships. 5. The thumb which has control of all activities of the palm represents the Mara – The God of Death who does not the let the activities stop. 6. The term Dependent Origination is also used for the 12 links forming a cycle of life & death or of each karma and its result. Each link is a cause for next link. We can stop the wheel/break the cycle by breaking any one of the 12 links. Thus the simplest way to attain Nirvana is breaking the cycle of karma. And breaking the cycle is breaking just one link. It is very easy, but to do that we need a lot of discipline and also right understanding. That brings us back to following the 8 fold path. This book will guide you through the process of freeing you from the cycle of karma. Of the 12 links we can observe 4 links being broken with each of the link being broken as we progress. Refer fig. 1 & 3. First fig shows the eight fold path on the palm, with action, speech, thought, awareness and concentration marked from top to bottom. Compare this with the 12 links in fig. 3. As soon as you start observing your actions and speech you start to break the cycle at the kamma-bhava (actions) link on index finger. When you observe your thoughts you break the cycle at craving link on middle finger as craving is followed by a flood of thoughts. With awareness you break the contact link on tip of ring finger as you are aware when there is any sense contact. You will observe how finer control is gained as you progress. With meditation you get still finer control of your karma on the little finger as your Volitional Activities are under control. Finally when you move towards your right hand and with insight you completely eradicate ignorance and you become finally free from the cycle of karma/wheel of life and move towards achieving Nirvana. Authors deserve congratulations for such an appealing, simplified, lucid, and scientific coverage of such a vast spiritual teaching. Your book is very impressive. where can we get a hard copy in Hyderabad? Thank you very much for your appreciation. We have intentionally not made a print version to keep it free for everyone. Anyone can print and distribute the contents as it is for free. There is a PDF version of this book under downloads link here.